Note: Spelling in the 16th and 17th centuries was seldom consistent and often done by the sound of the word rather than by a specified rule. Known alternate spellings of names and places are given in parentheses. Not much is known for certain about Henry Hudson's life, or any voyages he took, before he appears in written records, in 1607. Even the paintings and images commonly used to portray him cannot definitely be said to be of Henry Hudson - they could be of a completely different Elizabethan gentleman. Thomas Janvier, a 19th century Hudson biographer, wrote, "No portrait of Hudson is known to be in existence. What has passed with the uncritical for his portrait — a dapper-looking man wearing a ruffed collar — frequently has been, and continues to be, reproduced. Who that man was is unknown. That he was not Hudson is certain." Almost everything we know about Hudson and his four voyages in four years comes from just one work: Hakluytus Posthumous or Purchas his Pilgrimes, by the Rev. Samuel Purchas, first published in 1625 (see the page of source materials). In book III of this sprawling 20-volume set, Puchas reprinted all of the remaining records of Hudson's voyages: Hudson's own journals for 1607 and 1608, and the incomplete journal of 1610-11. Purchas added the 1609 journal by Robert Juet (one of Hudson's crew members), and the record of the 1610-11 voyage written by another crew member, Abacuck Prickett. Finally, Puchas reprinted the single page written about 1610 discovered in the desk of Thomas Woodhouse, himself abandoned on the great bay. Purchas himself provided very few comments on the journals. Most of the ships' journals are not commentaries, however, but rather terse records of the ship's speed, position and the conditions of the sea or weather. Sightings of land were also recorded because they identified a definite location. However, navigational equipment and techniques were not always accurate, so locations may be misrepresented. Events onboard, even troubles with the crew, were not necessarily recorded because they might make the captain look bad in the eyes of his sponsors. Journals were usually written by the master who was sometimes the only literate person onboard. In rare cases (as with Juet and Woodhouse), a literate crew member might have also kept a record. Another journal - Hudson's log of his 1609 voyage in which he sailed up the river that now bears his name - has never been reprinted. It went with his ship, the Half Moon, to Amsterdam after his return. In 1625, Flemish geographer Jan de Laet published his Nieuwe Werelt, a history of the exploration of the New World. In it, he reprinted fragments of Hudson's own journal of 1609. The actual journal was lost to history when it was sold to an unknown buyer, along with other archives of the Dutch East India Company, at a public auction in 1821. de Laet also reprinted a map by Dutch cartographer, Hessel Gerritz, showing the route of Hudson's 1610-11 voyage, apparently received from Abacuck Prickett (one of the survivors). Gerritiz (or Gerritsz) also printed a tract about Hudson in 1613. There are a few brief, tantalizing references about Hudson in other documents, seldom more than a few lines each. All in all, the printed historical records of Hudson's voyages listed above are less than 100 pages, easily read in an hour. Modern readers can find the originals of these works in various forms online, or read many of them in Donald Johnson's 1995 book, Charting the Sea of Darkness (see sources). Later historians George Asher (1860), Llewelyn Powys (1907), John Meredith read (1866) and Thomas Janvier (1909) searched the records to uncover any reference to Henry Hudson. They found few additional documents: some references in company papers, some possible genealogical links with other Hudsons, and the Admiralty records of the trials of the surviving mutineers. The author of this site has found previously un-noted references to persons named Hudson online in the British archives at www.british-history.ac.uk. However, the relationship between these Hudsons and the explorer is unclear and still to be determined. In part, one of the reasons for the confusion is that spelling - even of family names - was seldom consistent in those days, and there are many examples were members of one family spelled their last names differently, and even where one person changed the spelling of his or her name in a lifetime. John Meredith Read lists several variant spellings, including Herdson, Heardson, Hodson, Hodgeson, Huddesdon, and Herdsone. 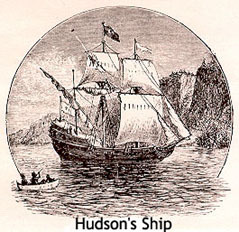 Hudson must have learned his craft and skills by travelling with contemporary seafarers, probably British mariners and explorers (possibly even sailing with John Davis on one his voyages to the Arctic) or even in one of the fishing fleets that cross the Atlantic for the rich banks off Newfoundland. There was even a suggestion he had visited the east coast of America once before. Like Frobisher before him, Hudson may have been in the company of a trading ship of the Muscovy Company. As a young man, Hudson may even sailed on one of the English ships that faced and defeated the Spanish Armada in 1588, as were many English sailors. But no records of his early years have yet been uncovered. "Voyages of purchase or reprisals (trading), which are now grown a common traffic, swallow up and consume more sailors and mariners than they breed," wrote Thomas Nashe, in Nashe's Lenten Stuffe (1599). "And lightly not a slop of a rope-hauler they send forth to the Queen's ships but he is first broken to the sea in the herring-man's skiff or cockboat, where having learned to brook all waters and drink as he can out of a tarry can, and eat poor John (dried, salted fish) out of sooty platters, when he may get it, without butter or mustard, there is no hold with him (no stopping), but once heartened thus, he will needs be a man of war, a tobacco-taker, and wear a silver whistle." By the time of his first recorded voyage, Hudson was a captain, seasoned and capable, skilled in navigation and reading maps. That alone is proof that he served on ships for many years before 1607: he had to do so to learn his trade. Hudson made four important voyages into the unknown, treacherous Arctic waters in four years, from 1607 to 1610, each time pushing the limits of knowledge and discovery a little further. His contributions to the exploration of the world as it was then known have generally been understated by modern sources, and were soon overshadowed by greater exploits of his contemporaries. However, the importance of his explorations should not be understated: he was a bold and determined navigator who pushed back the limits of the known world. No contemporary painting or portrait of Henry Hudson has ever been found and even the oldest we have were painted after his death by people who probably based their artwork solely on a description. Click here for a family tree and click here for maps of his voyages. Hudson was the architect of his own fateful tragedy that led to the mutiny in 1611. Obsessed by the vision of a northwest passage, he often ignored everything around him in his quest to find it. That included his crew and their fears - sailing into new waters was challenging, difficult and very stressful for most mariners. Yet it is difficult, if not impossible, not to admire his courage, his passion and his single-minded drive. He sailed blindly into the unknown, without maps, with only primitive means of navigation, and under appalling conditions. And he did it not once, but at least four times. Life for a seaman in Elizabethan times was hard, conditions were terrible and primitive, navigation was difficult and sailors were generally superstitious and often frightened of the unknown. Almost every voyage indicated some form of crew uprising or mutiny for Hudson. As captain, Hudson appeared weak at times, and vacillated between appeasement and force when dealing with crew, seldom disciplining them when or as required, often showing favouritism to some members at the expense of the others (and of his own authority). When he did attempt to exercise his authority, it came out in petty, small ways and eventually created a greater divide between himself and his crew. His attempt to show leniency to mutinous crew in Ungava Bay when strength might have been the better choice only led to further abuses and ultimately his demise. Hudson appeared unable to manage his men in times of stress. Hudson proved a competent navigator, but his personal ambition and goals often over-rode his judgment. Although courageous at times, he was headstrong and given to ignore the directions of his sponsors, and perhaps his crew. His contributions to the geographical knowledge of his day were great, but were overshadowed by the mutiny. Navigation in Hudson's day was inaccurate and often clumsy. Most ships were equipped with a magnetic compass, kept on deck in a small room called a binnacle (or bittacle before the 18th century). It could be illuminated at night by an oil-burning lamp. 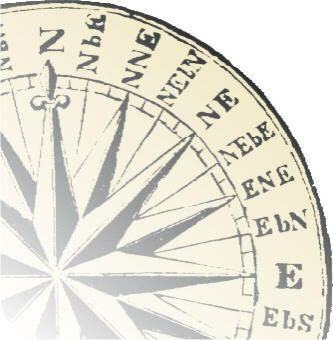 Most captains did not know why the compass needle pointed north and many preferred to keep the compass secret from superstitious crew members might be afraid the ship was being guided by sinister forces. A sand hourglass was the only reliable method of keeping time. However, if a crew member heated the hourglass with the lamp, it made the sand run faster, and could to shorten his shift, but upset the time calculations of the captain or mate. The most important navigational tool was the Stella Maris, or astrolabe. The captain would read the height of the North Star on its scale and from that determine the approximate latitude. Another instrument to assist in determining latitude was the quadrant. When the navigator lined up the sights on the Pole Star, a plumb line would hang straight down over the curved area to indicate the height of the star in degrees (equivalent to latitude). No sailor could accurately determine his longitude during this period (that was only solved with the invention of the chronometer in the 18th century). Most sailors relied on "dead reckoning" - the pilot estimated the ship's speed with a logline. This was a line with knots in it and a weighted wooden float attached to the end. The wooden float was thrown from the stern and the number of knots pulled off the reel within a given time told the ship's speed. Time was measured with one-minute glasses. Combining speed with the direction from the compass helped to determine progress along longitudinal lines. Each time the ship changed direction or tacked, the time, distance, and direction were measured again. Navigators also observed their surroundings, including cloud formations, wave patterns and directions, birds and floating debris. Dead reckoning was a complicated and unreliable process. Before Hudson came to history's notice, other explorers went searching for a passage over the north through the icy waters. The main reason was to find a shorter route to the riches of the Orient, especially the source of the lucrative spice trade. The early explorers of the western coast of North America were looking for the "Strait of Anian," an alleged passageway between Asia and North America, but believed to exist by most of Hudson's contemporaries. Marco Polo had described a navigable passage between Japan and Taiwan in his 13th century story. Through retelling, this became shifted and moved by later mapmakers. Cartographer Juan de Costa depicted the Strait of Anian in 1500 in the North Pacific. The strait appeared on maps by Munster in 1540, Mercator in 1569 and Ortelius in 1570. In 1562, Italian cartographer Giacomo Gastaldi wrote the two continents (Asia and North America) were separated by a strait called Anian. In 1566 Mapmaker Bolognino Zaltiere showed the strait on his maps. Englishman John Frobisher unsuccessfully attempted to find a Northwest Passage over Canada in 1567. Sebastian Cabot was convinced there was a navigable passage north of Russia, and believed the ancients had used in in the past. He became governor of the Muscovy Company and directed several expeditions to seek that passage. 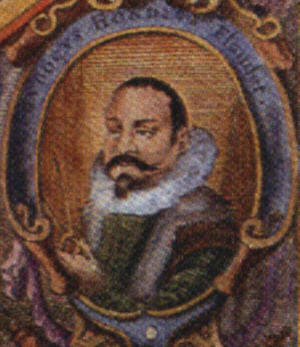 An English merchant named Michael Locke (Lok, also one of the Muscovy Company directors and the man who organized and financed Frobisher's expeditions), met a Greek mariner named Apostolos Valerianos in Venice in 1596. Valerianos, known as Juan de Fuca to the Spanish, claimed to have sailed from the Pacific to the North Sea (today's Arctic Ocean) through a broad inlet between 47˚ and 48˚ N. He claimed he reported it to the Viceroy of Mexico but was never paid for his explorations. de Fuca claimed to have sailed in the passage for more than 20 days. Although the story later proved a fabrication, his name was given to the strait south of Vancouver Island, which lies at approximately the same location de Fuca explored. In 1625, Samuel Purchas published the story of de Fuca, but it was widely known in England before then. In 1609, Lorenzo Maldonado provided a detailed, but fictitious, account of an ocean route from Spain across the Atlantic Ocean and then over the North American continent and through the Strait of Anian, reporting that he also saw a ship that also passed through the strait on its way to the Russian port of Archangel. Hudson may well have believed he would find the Strait of Anian in his quests. Since geographical knowledge of the area was limited or often speculative, most contemporary maps showed the northern shore of Asia far too low, helping keep alive the notion that there could be a clear passage north of Asia. Henry Hudson was probably born in the 1570s, possibly September 12, 1570. The death in 1555 of the Henry Hudson who is sometimes identified as his father means the explorer would have been born before then. Other sources identify this Henry as his grandfather. Some sources put the explorer's birth date as early as 1550, but this is probably too soon (he would have been 60 when he set sail on his last voyage). One source says he was 26 in 1588, others guess at a birth date of 1575. Some biographers place his family in Hoddersdon, in Hertfordshire, about 17 miles northwest of London. He may have sailed with John Davis in 1587 on his voyage to discover a northwest passage. On that voyage, Davis named the raging waters now known as Hudson Strait the 'Furious Overfall.' This connection has been suggested because Davis planned his 1585 attempt to find a Northwest passage in the home of Thomas Hudson, in Limehouse (now in the docks area of London's east end). Thomas may have been Henry's brother. Limehouse was also the home to one of Hudson's crew: Robert Juet. Based on a suggested birth date of 1570, Hudson would have been 17, a young man. As a young man, he probably served in the offices of the Muscovy Company in London because his family had shares in the company and served as officers in it. A Henry Hudson - possibly the explorer's grandfather - is listed in Queen Mary's charter (1555) as one of the founders of the Muscovy Company. The family coat of arms is an argent semee of fleurs-de-lis gules, a cross engrailed sable. His family owned a narrow, three-storey brick house near the Tower of London. Little else is known about his personal life before 1607. However, some authors have placed him on an English ship fighting the Spanish Armada in 1588, and on trading missions to the Mediterranean, North Sea and Africa, trading steel axes for gold, ivory and spices. He was old enough to be an experienced mariner in 1588 when the Armada attacked. Since he was an experienced mariner on his first recorded voyage, these stories are not outside the realm of possibility. Katherine Hudson (her unmarried name is unknown) was left very poor when Henry and John failed to return from their last voyage. She tried to get the East India Co., which sponsored the trip, to send out a rescue mission. Three years after Henry Hudson's disappearance, she applied to directors of EIC. They recognized their obligation to the "man who lost his life in the service of the Commonwealth" and sent a ship to look for Hudson (see Aftermath). It never found any trace of the abandoned crew, nor did any subsequent ship. Katherine also sought compensation for her husband's death, for which she was called "that troublesome and impatient woman" in company records. But she was persistent and eventually succeeded. Katherine also insisted the company take care of her son, Richard. The company paid him 5 pds. and sent him first to Bantam (the Dutch port in Java), then to Japan and finally Bengal as a company factor. Katherine managed to get the company to give her a post, too, although only after repeated argument. Under the company's approval and with their funding, she went to Ahmadabad, India to purchase indigo. She demanded special privileges there, at the company's expense. According to company manifests, she got "five churles of indigo, quilts, 37 chuckeryes, 46 pieces of simianes." She started suit to get the East India Co. to pay the freight back to England and after much effort got a settlement, which the company described as "the end of Mrs Hudson's tiresome suit." Katherine returned from that trip in 1622, a wealthy woman, and retired to her home in London. In her last two years, she was received at court at least twice. She was by all accounts a strong, willful woman. One source says she was married at age 30 in 1592, but that would mean her son Oliver probably probably couldn't have fathered his child Alice by 1608 (possible: he could have been 16 at the time). Katherine tried unsuccessfully to have a monument erected to her husband in the last years before she died, in 1624. She was buried Sept 11. She left all her belongings to sons Richard and Oliver. Hudson had three sons: Richard, John and Oliver. John Hudson was onboard as ship's boy with his father since 1607. He served in all four of Hudson's recorded voyages. He was among the crew abandoned in the bay in 1611. At the request of his mother, the East India Company entered Richard Hudson's name on the ship Samaritan, gave him five pounds, and sent him to Bantam, Java, Japan, then Bengal, India, to serve as a factor for the company. One source says he was 3 at the time of his niece's christening, in 1608. Richard was very successful in India and amassed a large fortune. As a trader for the company, Richard one of the first Europeans to be given a permit to live in Imperial Japan. On a trip back to England in the late 1630s, he became involved in a dispute with the company, the reasons for which were never made public but probably had to do with his finances. They threatened to send him to prison, but he defied the directors and returned to his home in Balasor, India. Several of his children migrated to the New World and his descendants are still in America. He died at his home in India, in 1644. Oliver Hudson had a daughter, Alice in 1608. Henry attended her christening that year. Oliver may have written the journal of his father's 1587 voyage, which was published in 1612, and presented as Hudson's own. There is some confusion among biographers as to whether the elder Henry Hudson was the explorer's father or his grandfather. Some have indicated the alderman, Henry, was his father (thus the explorer was born in 1550). Others say he is the grandfather (and the explorer was born later, perhaps 1570) - in which case there are three generations of men named Henry. After considerable reading of all the reports and records, I believe the alderman was his grandfather because otherwise the explorer would have been somewhat old for his adventures from 1607 (age 57) on. His contemporaries were generally younger, although this doesn't mean the explorer had to be. Still, it makes more sense in the telling. When Henry VIII met the French king, Charles V, at Gravelines, in 1520, a William Hodgeson (Hudson) was in attendance as the "Chiefe Officer of the Botrye." He may have been an ancestor of the explorer. Henry Hudson's grandfather was also called Henry Hudson (according to Hakluyt). It was sometimes spelled "Herdson, Hoddeson" or even "Hogeson" (Dictionary of National Biography, 1963-64). The explorer's grandfather was an alderman in the city of London. He was named in Queen Mary's Charter, 6 Feb. 1555, as one of the founders of the Muscovy Company (also known as the Worshipful Company and Fellowship of the Merchant Adventurers Trading to Muscovia), the same company that sponsored John Sebastian Cabot in his expedition to the New World. He was an alderman in the City of London. This Hudson died in December 1555, of "malignant fever." According to Fiske (1909), "Beside his great wealth acquired in trade, (Alderman Hudson) was lord of at least a dozen ancient manors, some of which had been conferred upon him by Henry VIII. out of the spoils of the monasteries." His grandfather (and probably his father) was a wealthy Londoner, a member of the Skinners and Tanners (one of 12 privileged companies from which Lord Mayor can be chosen), seems to have served as a city alderman, and owned property in Stourton, Lincolnshire. The Magna Britannica (1738) says that after the suppression of the monasteries by Henry VIII, the crown granted forfeited church lands at Hitchin, County Hertfordshire to Edward Watson and Henry Hudson. The Magna Britannica also says this Henry Hudson purchased the manor of Bertrams and the manor of Newington Belhouse, in Kent. He also purchased the manors of Skelting, Ackhanger, Terlingham, Folkston and Walton. He was named as the Lord of the Manor of Sweton. This shows he had considerable wealth and must have had close relations with the crown and the nobility. His grandfather seems to have died in December, 1555, in London, of a "malignant fever." Six other aldermen died of it that year. A record of his funeral, December 20th, 1555, says the service was held at the Church of the Grey Friars in London. An inscription in that church notes the burial of Rudolph Hudson, husband of Elizabeth, on June 27, 1530. These may have been great grandparents of the explorer. Henry's widow (the explorer's grandmother), Barbara, married the alderman Sir Richard Champion, who became Sherriff in 1558, then Lord Mayor in 1566. She died in 1568 (Magna Britannica says 1561, but her monument says 1568). She died "without issue" (childless from that marriage). The explorer's grandfather father had eight sons - including Thomas, John, Edward, Christopher(? ), (William? see below) and Henry. The grandfather also had three daughters, one of whom as named Abigail and she married Charles Dixwell, of Warwick. The explorer's father may have died in 1585 (?). he is mentioned in a lawsuit in 1572. The Calendar of State for James I shows several entries for persons named Hudson in 1604, including James Hudson, who was a Groom of the Privy Chamber. There is no direct link to show these were related to Henry Hudson, however. Christopher was named as factor of the Muscovy Company in Russia, served as agent from 1553-1576. He was probably the explorer's uncle, not a brother. He lived in Russia for a time as agent for the Muscovy Company. By 1583 he had risen to a position of importance within the company. He took a deep interest in Sir Humphrey Gilbert's voyage of discovery to America in 1583, and he advised the company to assist in raising the necessary funds. Once again there is some confusion of names: there are two Christopher Hudsons on record in the Muscovy Company, one knighted (Sir). They appear (according to Read) to be father (Sir) and son. There is some evidence the father was either the explorer's uncle or possibly his great-uncle. Christopher was listed as a governor of the Company of Merchant Adventurers in 1601, spelling his name 'Hoddesdon' in a letter from that year. Thomas, another uncle, was a sea captain in employ of Muscovy Company 1577-81 and made at least one trip to Persia for the company. He sold his inherited lands to his brother John. Thomas Hudson, a resident of Limehouse (as was Henry Hudson's later nemesis, Robert Juet). 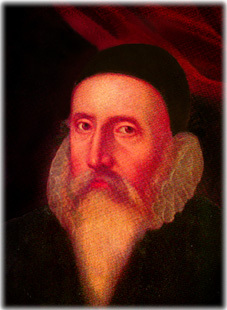 On 24 January, 1583, Thomas Hudson advised Captain John Davis concerning his search for a northwest passage to China, which resulted in the discovery of Davis's (later Hudson's) Strait, A Thomas Hudson is also noted in historical records as being friends with Dr. John Dee, the astrologer who served Queen Elizabeth and also promoted exploration of the New World to the crown. Dr. Dee's diary of 1583 notes he met with several people including John Davis and "Mr. Hudson" to discuss the "N.W. voyage." Thomas apparently has a passionate ambition to find a northeast or northwest passage to the Orient, and he may have influenced his nephew to the same. John Hudson (uncle?) consulted with John Davis about finding the Northwest Passage and assisted in deliberations which resulted in Davis' famous voyages. Stephen Hudson was a member of the East India company, originally promoted by some of the foremost members of the Muscovy company. He is mentioned in the "Court Minutes" of the former corporation on 13 December, 1602, as having paid to Mr. Chamberlain, the treasurer, "for his supply toward the discovery of the Northwest passadge, and desired the Company to have him excused for non-payment thereof till now, for that he haith bene in the country all this summer and never heard thereof." Brother? There were numerous Hudsons who worked for the Muscovy Company (founded 1555) , serving as captains, factors and agents. Some were clearly Henry's relatives, but little is known about most of them or their ties to the explorer. David Hudson, a modern American descendant of Henry Hudson, put together a family tree, helped in part by records kept by the Church of Latter Day Saints, the Hudson Family Association (HFA) and The Hudson Family History by Van Alan Hudson. Click here for a table of five generations of Henry Hudson's family tree. There are more than 90,000 descendants of the Hudson family listed in the HFA database. Sir George Barnes (d. 1558), Lord Mayor of London and also of the Muscovy Company, married a woman named Alice who may have been a Hudson. She died in 1569 and was mentioned in a letter to Christopher Hudson in 1560. His son was also named George. The elder Barnes's son-in-law was Sir Francis Walsingham, spymaster for Queen Elizabeth I, and promoter of explorations in the New World. The Hudson name itself dates back to 1066 in Yorkshire, northern England. The oldest known Hudson Coat of Arms consists of Three Lions in the Rampant position with three boars heads as supporting badges, but the Hudson Coat of Arms changed several times. The arms of Henry Hudson (1st generation recorded here) are described as "argent, semee of fleurs de lis gules, a cross engrailed sable. The early Hudson colonists in Virginia used a variation of this design to mark their livestock, which may lend credence to their claimed relationship to Henry. Henry Hudson today is mostly known for a few place names in the atlas which indicate where he travelled, and a handful of schools or institutions named after him - and a white rose. But his voyage of 1607 cast him in the role of the father of the whaling industry in the 17th century. His reports about their numbers soon led to the wholesale slaughter of these gentle mammals over the next four centuries, but created an economic boom for England. The same fate was in store for the walrus he reported on journeys north. A more enlightened present may look on whaling and hunting walrus as ignoble and savage, but in Hudson's day they were important industries. Biographers have found fragmentary information in surviving records about his family and his background, although some is still supposition and conjecture. You may want to refer to the sources listed in the bibliography on the links page for other reading material. Captain John Smith, founder of the English colony in Virginia. He informed Hudson that there was a passage to the Pacific Ocean (the 'Western Sea') north of Virginia (below 40°), possibly through a river or inlet. Smith sent him charts. Hudson probably intended to visit Smith in Virginia, and although he came close in 1609, Hudson turned north instead. He may have been afraid the English would fire on his Dutch ship before they found out who was its captain. Smith wrote glowingly of Hudson after he learned Hudson had been cast adrift in the great bay, leaving one of the few physical descriptions we have of Hudson. Smith had been in London in 1604, left for Virginian in 1609, and was back in 1609. His settlement was of great interest to members of the Muscovy Company, including Sir Dudley Digges and John Hudson. Peter Plancius: This Dutch clergyman and scholar met Hudson while the latter was negotiating with the Dutch East India Company, 1608-1609. Petrus Plancius was a founder of that company. Plancius had started a school of navigation, which gave the Dutch the skills to rival their former overlords, the Spanish. Among his pupils was Willem Barents, Arctic explorer. Hudson told Plancius he did not believe a route to the east lay through the northeast passage, but rather through the northwest. By this time, several expeditions had failed to make it past Nova Zembla into the ice-choked Kara Sea, including Hudson's second voyage. Hessel Gerritsz: Another Dutch cartographer working for the United Dutch East India Company whom Hudson met in his negotiations for his third voyage. Gerritsz and his associate Jan de Laet would later publish parts of Hudson's lost 1609 journal, as well as the first map of Hudson's 1610 voyage. Gerritsz believed Hudson was acting for the English merchants in 1609, not his Dutch employers. Rev. Richard Hakluyt (born circa 1552) knew Hudson and recommended him to the Muscovy Company as the commander of his first voyage, in 1607. Hakluyt's two books, Divers Voyages (1582) and Principal Navigations (1589, revised and expanded in 1599-1600) were important records of mostly English voyages and explorations to 1600, and were an influence on both Hudson and his employers. In 1584, Hakluyt also published a manuscript on behalf of Sir Walter Raleigh that helped secure support from the Queen for his colonial venture. The Rev. Samuel Purchas was Hakluyt's successor, picking up the narratives of exploration after Hakluyt died, but expanding them considerably in scope and regions covered. Purchas wrote he had met with Hudson after he returned in 1608 and found Hudson very melancholy at his failure. In 1625, Purchas also published an important book recording the voyages and adventures of English mariners, including Hudson, called Purchas his Pilgrims (a sequel to Hakluyt's Navigations - see the sources). Dr. John Dee: Court astrologer, geographer, and a significant influence on Queen Elizabeth for several years. He studied mathematics with Gerhard Mercator. Dee also practiced the occult arts. One of the most enthusiastic supporters of the fabled "Strait of Anian" story. Flemish cartographer, Abraham Ortelius, visited Dee at his home at Mortlake, in March, 1577, to share his knowledge of the fabled strait. Dee also believed that America was Atlantis and that a northern passage to Cathay existed as a natural balance to the Strait of Magellan in the extreme south. He believed finding a passage through (or over) the continent would not only give Britain greater access to the wealth of the Indies, but it would also offer him greater opportunities to learn the occult practices of the East. For Dee, the search for the Strait of Anian was closely tied to his search for the Philosopher's Stone, which alchemists believed could turn base metals into gold. Dee also believed the ice at the north would vanish because the North Pole would prove warmer as a result of the constant summer sunshine. Dee was tutor to Sir Dudley Digges and lectured Martin Frobisher and his crew on mathematics and navigation. In 1576, Dee wrote a four-volume treatise on the potential for creating a "Brytish Impire" (empire), and even recommended teaching Englishmen foreign languages like Chinese for when they went sailing to the Orient. His passionate belief that England had historical claims on the New World was transmitted to his circle at court and influenced English exploration for several decades. Dee was an active supporter and investor in Martin Frobisher's voyages to mine what Frobisher believed was gold ore, found near Baffin Island. After that failure, Dee turned his attention to promoting a Northeast Passage. His influence at court began to wane when he started to record "conversations" with angels, transmitted through his new 'assistant,' the mysterious charlatan, Edward Kelly. Kelly and Dee went to Europe, but Dee returned in 1588 after Elizabeth requested it. He was insolvent by this time, and struggled for money and a lucrative post until his death, in 1609. Shakespeare gives us a caricature of Dr. Dee in his character Prospero, in The Tempest.